Input text: A 5 feet high and 100 feet wide mountain is in a forest. The mountain is texture. The texture is 14 feet wide. A tree is -3 feet above the mountain. A [woodland] wall is 1 foot behind the tree. A humongous [woodland] sphere is behind the wall. It is leaning 60 degrees to the front. 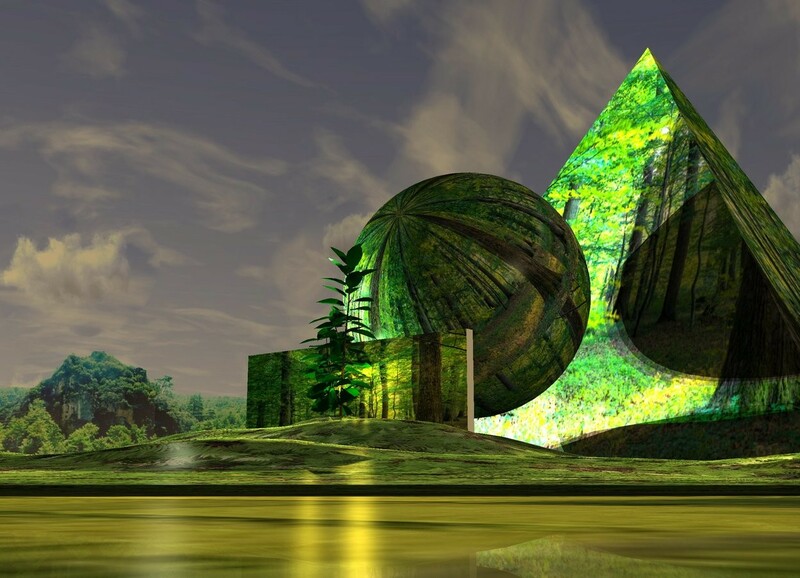 A 50 feet wide [woodland] pyramid is behind the sphere. A lime light is in front of the tree. A light is above the tree. 4 lights are 8 feet to the left of the wall. Camera light is black. 6 lemon lights are in the tree. 6 violet lights are to the left of the tree. 6 violet lights are in front of the tree. It is dawn.